The pumpkin, butternut squash, and apple in this chili recipe give the perfect amount of fall flavors without too much sweetness. This is a hearty, thick chili that is perfect for Halloween night and any fall potluck. However, I’ll definitely be making this recipe through fall and winter. It’s that good! Heather shared this recipe a few years ago and it’s a new favorite. This batch is bigger batch than the original recipe, so I added a can of tomato sauce so it won’t get too dry. Brown the turkey and drain off the excess fat. Put all of the ingredients in a crockpot on low for two to three hours. Or you can simmer on the stove on low for 20 – 30 minutes. Serve with a side of sour cream and corn scoops, tortilla chips, or cornbread. I’ve tried it with all three! Now you’re ready for potluck time! Memorial Day is the unofficial kickoff for BBQ season! Dips, salads, delicious sides, anything grilled, and easy desserts are perfect for the occasion. If you’ve ever been to the California Central Coast for barbecue, then you’re familiar with Santa Maria style beans. Until a few weeks ago, I couldn’t find the pinquito beans in local stores (they’re native to and could only be found in the Santa Maria Valley). I was at Vons and stumbled upon the S & W Pinquito Beans with Onion and Garlic in the canned beans section. They were on sale and I bought a ton! The beans, straight out of the can, are pre-seasoned and are actually really good (great for camping, etc.). But, they do need some additions to taste like the real thing. I scoured the internet for various recipes and each one was very different, so I took ingredients from several and made up my own. I don’t ever recall bacon being in these beans, but added it anyway because…it’s bacon. You can’t go wrong! This recipe can easily be doubled or quadrupled for a larger crowd. Cook the chopped bacon in a skillet on medium-low heat for 10 to 15 minutes or until crisp. Add the chopped onion and chili powder and cook for another 10 minutes. Add the garlic and cook for five minutes more until the onions are soft. Combine the bacon-onion mixture with the canned beans in a pot. Add tomato paste and salt and pepper, to taste. Cook the beans on low for approximately 30 minutes (make sure you don’t overcook them as you don’t want the beans to get too mushy). You can serve them immediately or transfer to a crockpot and keep on warm. I can’t believe that Cinco de Mayo is less than two weeks away! This is one of my favorite potlucks because it’s a chance to make some of my favorite recipes. Make sure you check out the Baked Corn Casserole, Quick and Easy Refried Beans, and the Salsa Dip, as these are especially easy to make! It’s National Pineapple Upside Down Cake Day and I’ve been waiting for any excuse to make these again! The brown sugar butter glaze caramelizes the top perfectly to make these sweet and luscious Pineapple Upside Down Cupcakes. Spray the baking cups really well with non-stick cooking spray. Drain the pineapple slices and set the juice aside. Cut the pineapple rings into four pieces each. Cut the maraschino cherries in half. On low speed for 30 seconds, mix the cake mix, oil, eggs, and pineapple juice. Continue mixing on medium speed for two minutes. In a separate bowl, combine the butter and brown sugar. Put 1 1/2 tsp. of butter mixture into each baking cup. Add a maraschino cherry in the center (round side down) and then add two pineapple slices on top of the cherry. Lastly, add 1/4 cup of batter on top of everything. Serve warm or at room temperature. You’re ready for potluck time! It’s National Cheese Ball Day and this one just never gets old! It is one of my most-requested dishes and everyone seriously goes crazy for it. The cream cheese, pineapple, green bell pepper, and walnuts make an absolutely addicting combination. One batch can make three small or two large balls. However, I highly recommend that you bring two large cheese balls to your potluck. I recently only brought one to a party and it got ugly. Lesson learned! 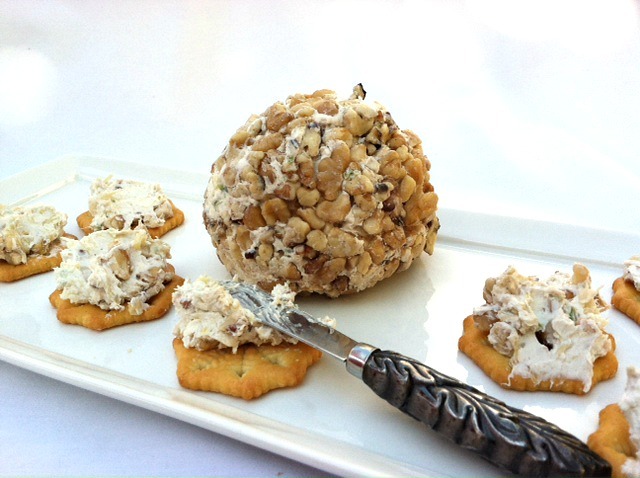 This cheese ball is so good that people will fight over it! Combine the cream cheese, pineapple, bell pepper, onion, salt, and 1 cup of the chopped walnuts. Refrigerate until firm. Form cheese balls and roll in remaining walnuts. You can serve right away or put in an airtight container and refrigerator until serving time (keeps for about 3 days). Then serve with crackers. Ritz crackers are especially good with this recipe. You can make these Pizza Potstickers with only four ingredients and be done in less than 15 minutes! This is definitely my newest, favorite potluck recipe. They’re yummy and they look good, too! I found this ingenious idea in the back of my latest issue of Food Network Magazine. Love it!! Heat the oil in a nonstick pan over medium high heat. Put all of the potstickers flat side down and cook for three minutes. Add 1/4 cup water, cover, and cook for another three to five minutes or until the bottoms are brown and crispy. Transfer the potstickers to a foil-lined baking sheet. Top with pizza sauce and mozzarella. Broil until the cheese is bubbling. Top with chopped basil (optional), transfer to a serving dish, and you’re ready for potluck time! It’s Friday! It’s cold outside. It’s National Chili Day. Make some chili! Check out our Soups/Stews/Chilis section for recipes.